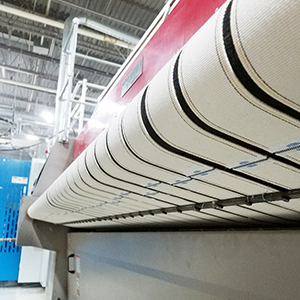 New feed board guide rakes for flatwork ironers and folders from laundry product supplier Tingue (www.Tingue.com) provide the ideal configuration needed to keep feed belts securely in place and properly aligned during long-term, 24/7 operation without overlapping each other. Virtually eliminating the potential for linen jams due to belt misalignment, the new rakes reduce go-backs and downtime for maintenance while also preventing premature belt failure. Proven effective in retrofits on cylinder ironers, large roll ironers and folders in hotel laundries, hospitals and textile service plants, the durable, steel feed board guide rakes are custom manufactured at the company's Greensboro, NC, parts facility based on the requirements of each laundry machine to address the belt width, number of slots per belt, and open spaces for photo eye sensors, among other specifications. In addition, the custom rakes help ensure proper belt tracking even when installed on flatwork ironers with damaged or missing fingers. Offered exclusively from Tingue representatives, the new guide rakes are available for laundry equipment from Jensen, Braun, American, Chicago Dryer, CMV and other manufacturers. There is no minimum order quantity.